WhatsApp, the Instant Messaging (IM) platform which is part of the Facebook stable is celebrating a significant milestone. Yesterday it was announced that it now has 1 billion users. The news was shared on the WhatsApp blog and through a Facebook post made by WhatsApp co-founder Jan Koum. Mark Zuckerberg, the founder of Facebook also posted a congratulatory message on his timeline. 1 billion users is an enormous feat by any standard considering how the platform has taken 6 years to get to this stage in an environment where there are competing IM platforms with more or less similar proposition. For the WhatsApp and Facebook camp, it has helped cement the IM platform’s relevance despite a yet to be realised return on investment for the $19 billion paid to acquire it. It is the most popular instant messaging application outside China, followed by Facebook’s Messenger (800 million users) and WeChat (650 million users). 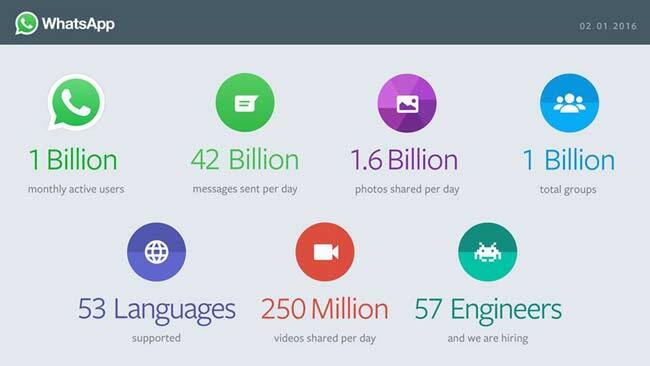 According to the information shared by Koum yesterday, WhatsApp is handling 42 billion messages and 1,6 billion images and 250 million videos a day. It supports 53 languages and has 1 billion total groups with all this work for a multi-billion company being handled by 57 engineers. These numbers are enough to make anyone swoon, but the real test will be in how it monetises all its efforts. From the beginning, in-app advertising was declared as a no-no by the app’s creators and even after being acquired by Facebook, this promise was reiterated to its then-450 million users. More strikingly was how its $1-a-year subscription model was recently scrapped. The entire tech industry is now waiting to see how these 1 billion+ users are going to contribute to the business side of WhatsApp, with suggestions of a business-to-consumer communication model, similar to what Messenger launched in 2015, being the starting point. Going off on that tangent has a lot of possibilities, even in the emerging markets where WhatsApp is a very dominant. Looking at the case of Zimbabwe, for example, WhatsApp could become a paid for promotional tool that has a greater conversion and engagement among users in a manner that disrupts advertising. An integration of payment methods could also earn it a more significant spot in the average consumer’s sphere, encroaching on the options for paid services and online commerce through the one app that they use the most. Thats 1 billion less texts I can say i see why operators are crying sheep all that easy profit fone.